Iceberg A68 calved from the Larsen C ice shelf earlier this year. I wrote about before. a mysterious marine ecosystem that’s been hidden beneath an Antarctic ice shelf for up to 120,000 years. To have the chance of making observations in an untouched environment like that is so exciting, that the British Antarctic Survey are running an expedition to investigate. You can read about it in a great piece by Victoria Gill on the BBC news site, and the brilliant Katrin Linse has done some great work with Radio 4 and the BBC Breakfast program (2hrs 20 mins in source BAS twitter account) explaining both the purpose and the work. I was looking this morning at the recent Sentinel-1 imagery on Polarview, this is an image of A68 captured on 11 February 2018. It's big - about 5,200 km2. 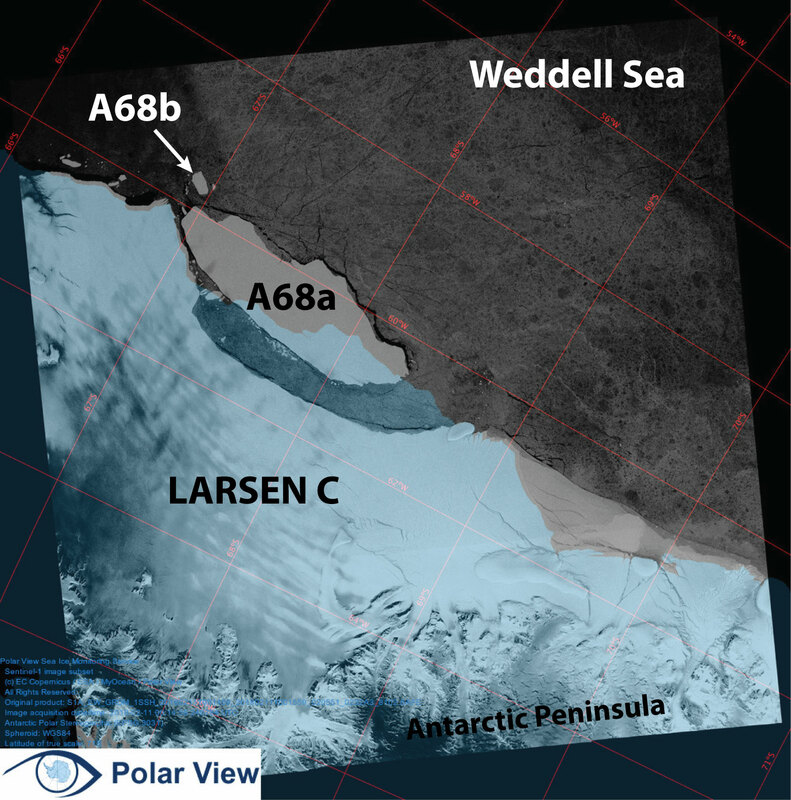 Iceberg A68 and the Larsen C Ice shelf captured from with the Sentinel-1 SAR sensor 11 February 2018. I labelled some features in the image: the iceberg and the ice shelf are the relatively solid grey colour. The blue overlay is where land and the ice shelf roughly were (it's called a land mask). One thing you can see is the speckled grey colour which covers the top right hand side. This speckled grey is sea ice. It's a relatively thin cover of a typically 1-3 m thick. If you map the current sea ice distribution, and the location of iceberg A68 you can see how much sea ice they are going to have to sail through to reach the region. 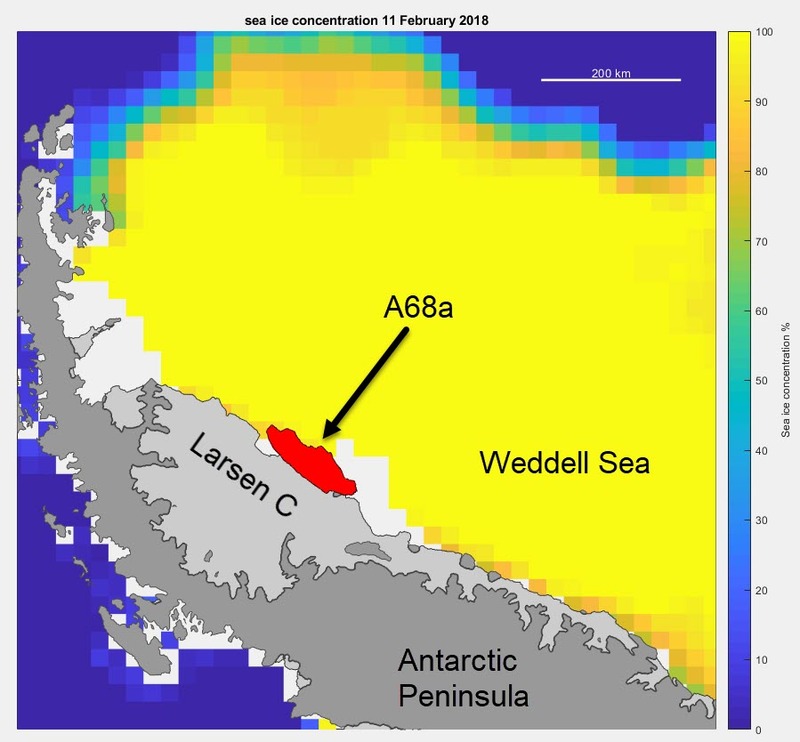 Larsen C, the iceberg A68 and the sea ice extent on 11 February 2018. 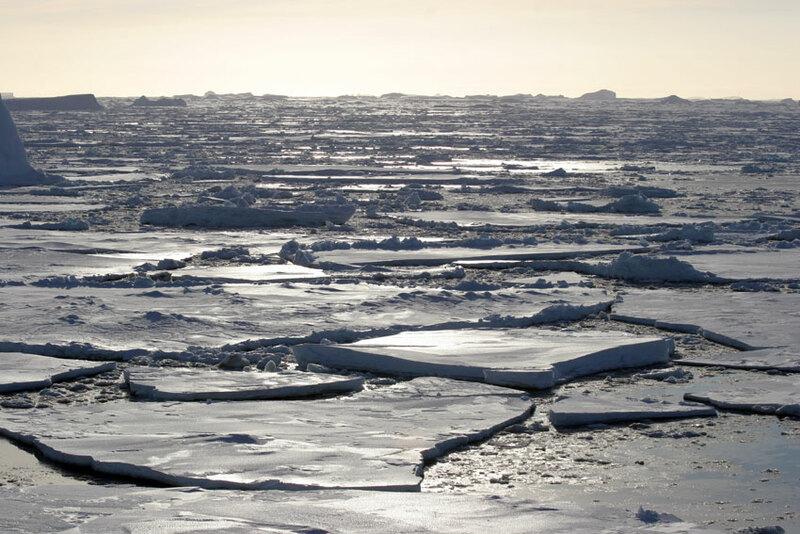 There is a lot of high concentration sea ice between the ice edge and the iceberg that the ship will have to traverse. RRS James Clark Ross is a very capable ship, and she will be able to make way through the ice. The issue is this can take a lot of time. And time whilst ice breaking is fuel. In open water a research ship can cover ~22 km per hour, in sea ice if you are breaking ice then maybe 5 km per hour would be good, and you probably wouldn't break ice 24 hours per day. Plus if you sail 400 km in the ice, unfavourable winds can easily compress the sea ice and trap a ship. It's happened before, and in the modern era even capable ships get can get held up. The satellite I used to make the image doesn't do so well in coastal regions, so given some favourable winds there could be a nice channel for them. I am going to be watching the visible satellite imagery for that. It's easy to make pronouncements from 14,000 km away, but really the people on the ground will work it out. Whatever happens I know that the researchers on board will do some great research. Plus I would be surprised if A68 moves too far from the region in the next year. 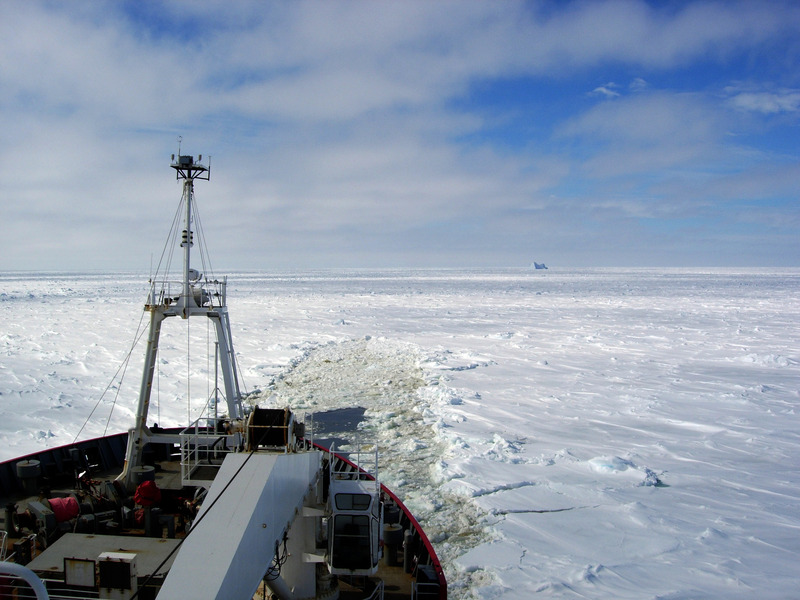 Breaking Antarctic sea ice on the RRS James Clark Ross. But if you try sometimes, you might find you get what you need. At the moment they will have to get through ~300 km of sea ice. Posted in Science. Tags: A68, antarctica, Larsen C, RRS James Clark Ross, Science, sea ice on February 13, 2018 by Mark Brandon.